Natural Flavorings, Where are They Coming From? 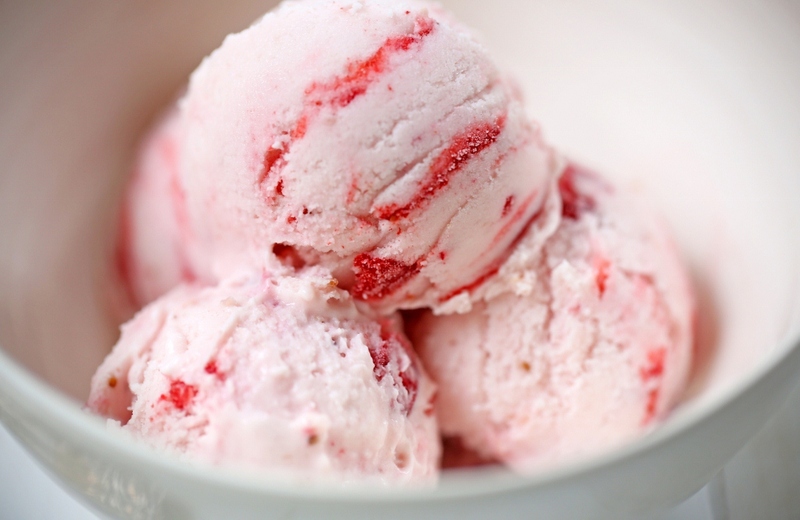 Imagine this: you’re at the grocery store and pick up two brands of strawberry ice cream. One boasts the words “natural flavors” on the front so you decide to purchase that one. Have you ever stopped and wondered where the natural flavors in some of your favorite foods come from? I really hadn’t either, until last spring. I was enrolled in Theories and Practices of Weight Management, a class that is team-taught by Dr. Akers, a Dietetics professor, and Dr. Edwards, a Kinesiology professor. Overall, the class was extremely interesting. One particular lecture opened my eyes to the world of food flavorings and, let me tell you, it’s a scary world. Who runs the world of flavors? That would be the flavor companies, such as the Swiss company Givaudan. Companies such as this one hire scientists to be their flavorists; these are the scientists who create and combine the natural and artificial flavors that go into many of the foods you put into your body every day. Food companies employ the use of the flavor companies’ concoctions to make people addicted to the foods they eat, which will keep them coming back for more. To do this, they must go taste test the actual food they are trying to mimic. Once a flavorist finds a food with the right addictive qualities, they extract the flavor and can then head back to the lab to mimic it with chemicals. For example, the video that was shown in my class (which you can find below) shows the flavorists from Givaudan, the company I mentioned before, taste testing citrus fruits. They blatantly admit to wanting to find tastes that don’t linger on the tongue to keep you, and the rest of America, wanting more. I decided to take a look at Givaudan’s website. What is the first concerning thing I notice? They also make fragrances. Yes, the fragrances that are probably included in your favorite perfume, cologne, shampoo and many other items you put onto your body are made by the same company that manufactures the flavors that you put into your body each day. So where do the flavor creations come from? According to http://www.understandingfoodadditives.org, artificial flavors are flavors that you cannot find in nature but they mimic specific flavors. Basically, these are chemicals. “Natural” flavoring is where this topic gets tricky. When you read the words “natural flavor” on the front of the ice cream I mentioned earlier, you think “This must mean they extracted the flavor from the strawberries and put it into the ice cream,” right? Wrong. According to the aforementioned website, that natural flavoring probably didn’t come from the ripe juicy strawberries you’re thinking of; natural flavors can come from animals and plants. These flavors are processed or chemically extracted to mimic the foods you’re imagining in your mind. In the video that I mentioned earlier, the host says that “natural” vanilla and strawberry flavors can be processed from the gland on a beaver’s backside. Yes, you read that correctly. Some of your favorite natural flavors actually come from animals. They can get away will still calling them natural because an animal is still a natural thing. Another interesting discovery I made on the Givaudan website is that one of their lines of flavorings to enhance flavors. When a company wants their frozen chicken to taste more “chickeny”, they can add the lab created flavorings to enhance the appearance of the chicken flavor. They do the same thing with coffee flavoring to enhance actual coffee. All products boast that they can help a company win over a crowded market. My questions and concerns about this issue are simple. Why are people settling for flavors developed from chemicals or gland secretions of a beaver? As a society, we keep trying to create the next best thing or make things bigger and better. What would happen if we stop and take the time to appreciate the truly natural food around us instead of constantly consuming the unknown? We might find that we actually enjoy the food we are eating instead of becoming addicted to it. Don’t believe me? Check my sources to see for your self!